Mandy meets Nik and wife Laura the team behind the fabulous food and warm welcome at the Victoria Inn. 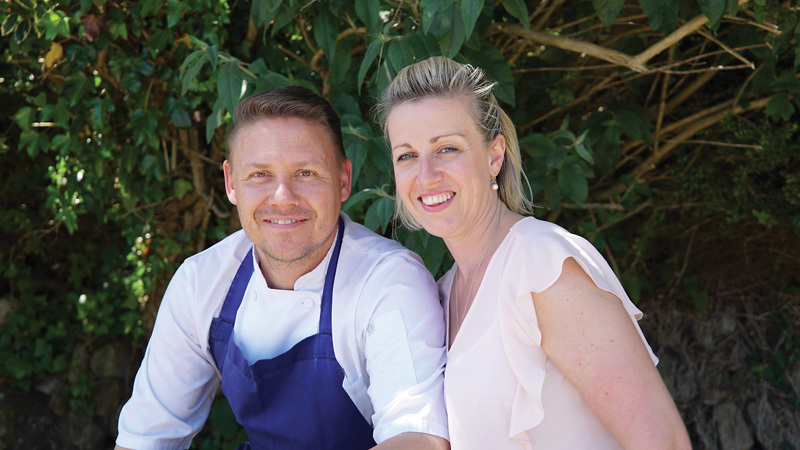 Awesome and booming are words that ebullient, inn-keeper Nik Boyle uses a lot: “Cornwall is booming, the Vic is really finding its feet and life is awesome”, the past year has been awesome and his lovely wife Laura is… awesome. “Just the perfect foil for me, she runs the business, keeps the team motivated and is the warm smile that greets you when you come in.” Nik tells me with a huge smile. The couple married a year ago shortly after taking over the pub. Laura laughs and says, “I have always loved this part of Cornwall and always dreamt of living here and I don’t ever see myself living anywhere else but over the last eighteen months, it’s felt rather like I was on witness protection… we sold our home and business in Hampshire, moved to this lovely, tiny village in Cornwall, got married and changed my name!” But Laura tells me it has all been wonderful and wouldn’t change it for the world. As from September the ex-ballet dancer excitedly tells me she is dancing again and teaching classes on Saturdays in Penzance. Good luck for the next year! We’ll definitely be back to this fabulous little pub!